Image credit: © B. Dupont from Flickr. Some rights reserved. **Taxonomic note: Subspecies listed based on morphological characteristics. Genetic studies have yielded new insights, but subspecies designations still being refined by taxonomists. populations with more prominent stripes due to reduction in shadow stripes (brownish stripes in between black and white bands). Range: Most widespread distribution of all wild equids. Eastern and Southern Africa. Habitat: Habitat generalist. Found in grasslands and grassland-bushland or grassland-woodland mosaics. Population in Wild: No recent estimates. Estimates of 796,000 - 1,326,000 in 2002. Locomotion: Walk, trot, gallop, and run. Styles similar to those naturally occurring in horses. Swim to cross rivers and streams. Activity Cycle: Diurnal; travel, feed, and socialize in daylight. Sleep in groups at night. Social Groups: Live in family groups known as harems; composed of a single adult stallion (male), one or more adult mares (females), and their offspring. Harems often aggregate to form large herds, though typically each lives independently of one another. Diet: Mostly grasses. Survive on bark and other coarse vegetation in times of famine. Predators: Adults taken by lions and large packs of spotted hyena. Cheetah, African wild dog, and leopard take foals. Nile crocodile opportunistically kill zebra. Sexual Maturity: Stallions 4-5 yrs, mate only after forming own harem. Mares mature at 1-3 yrs, though typically first reproduce at 3-4 yrs of age. Longevity: Maximum longevity c. 30-40 years in captivity, more commonly 11-17 years; maximum longevity in the wild c. 20 years. 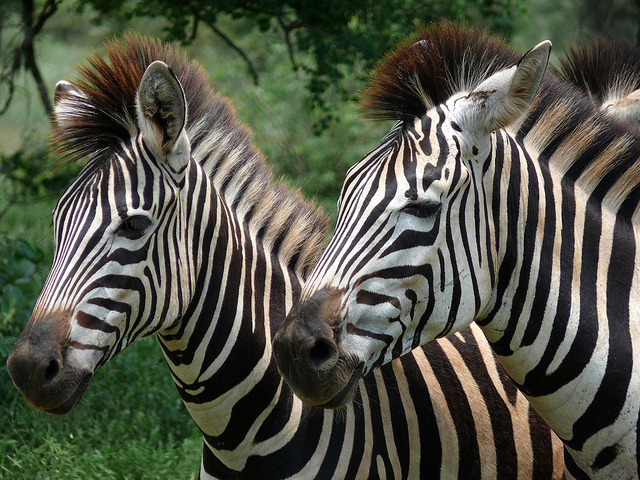 Feature Facts: The distinctive black and white coats of zebras can be used to identify individuals. Researchers studying populations can read these patterns (almost like a bar code) to track individuals as they move through large herds on the African plains that they call home. The zebra is physically and behaviorally similar to the domestic horse. Females live within a social group, known as a harem, that is led by a single male stallion. As social animals, zebras exhibit complex behaviors which serve to reinforce relationships between members of a harem. Members greet, groom, and maintain contact with one another. © 2015-2019 San Diego Zoo Global. Updated April 2015. Taxonomy, IUCN Status and population estimates updated Apr 2019. We are grateful to John Register for providing content review of this fact sheet. John is currently the Hoofed Stock Supervisor with Houston Zoo and serves as the AZA Studbook Keeper and is the Program Leader for this species SSP.